Fifty years ago, a legend was born when Dr. No first introduced James Bond to the big screen. Since then there have been over twenty Bond movies, some classics revered by movie fans (Goldfinger, From Russia with Love), some giant duds (A View to a Kill). In 2006, after it looked like the Bond series was dead, the format reworked and the result was Casino Royale. The film debuted with a new Bond (Daniel Craig) and received rave reviews from both critics and Bond fans alike, who praised the series’ new mood. But the follow-up Quantum of Solace was a major disappointment for all and many have wondered if the Bond series has fallen back into the gutter. The first two minutes of Skyfall, though, proves this theory wrong. Skyfall is one of the best Bond films ever made and proves that the Bond series is still culturally relevant today. The theater I attended was jammed packed to the extent that some audience members were sitting on the stair. The audience erupted into applause by the film’s conclusion. Skyfall starts out in Instanbul where James Bond (Craig) chases down a man who has stolen a hard drive full of MI6 secrets. After chasing him down to a train, Bond is accidentally shot by a fellow agent and assumed dead. But when M (Judi Dench) discovers someone is leaking the secrets from the hard drive, which include many agents of MI6, Bond reappears and rejoins the MI6 to prevent any more leakage. At the same time, M is under pressure to retire from her boss Mallory (Ralph Fiennes), who believes it will protect her reputation. Despite her age, M is unwilling to do so and want to fufill her job. 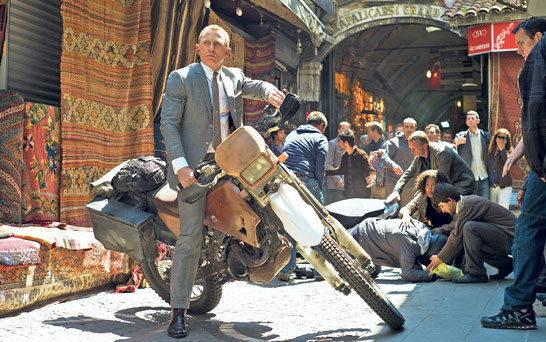 One thing I noticed about Skyfall is that it has more of the old James Bond feel. Both Casino Royale and Quantum of Solace were very dark but Skyfall is much more lighthearted in comparison. That’s not a criticism, but actually suits the movie very well. There’s some humor in the film, mostly played out by Q (Ben Wishaw), who supplies Bond with his gadgets, as well as from Bond himself. While I was worried that this wouldn’t play out well, I was surprised that it was executed so adeptly. In a way, it reminded me of Connery’s Bond movies, which I have really missed. The villain in the movie, Raoul Silva, is played by Javier Bardem. Anyone who has seen the Coen brothers’ No Country For Old Men knows how good of an actor Bardem is (his role as Anton Chigurh was quite chilling and one of the best performances of the last decade) and he does an excellent job here. Silva is similar to Anton and Bardem gives some of the movie’s best moments. Daniel Craig really deserves some credit. When I first heard he was picked as Bond, I was unsure if he could do the role but now I fully believe him in it. Craig’s the best Bond since Connery undoubtedly and fits the role almost perfectly. Craig can deliver his lines well and do great action scenes without going over the top like Roger Moore. One reason why I believed the tone changed so much is director Sam Mendes. Mendes is known for directing films like American Beauty and I thought it would be strange to have him direct a Bond film but he does it very well. The action scenes are very well-choreographed and the film moves at a lightning fast pace. Skyfall is everything a great Bond film should be: exciting, smart, and clever. It ranks as one of the best James Bond films and cements the series’ golden reputation. Here’s to fifty years of Bond and to hope for fifty more! It will not disappoint you. It’s one of the best James Bond films. Thanks for commenting. I did love this movie a lot (saw it last night). Much better than QoS. But better than Casino Royale? Hmmmm…. I enjoyed it more than Casino Royale, which is saying something because I really liked Casino Royale. Glad you loved it too. Thanks for commenting. There’s always that balance between the campy Bond and serious Bond , isn’t there? Javier Bardem personified that. He’s kind of amusing, but also quite threatening. I really like the way this film straddled the line. Nice review! Thanks! I noticed that as well. He was amusing but also threatening, sort of like a combination of Anton Chigurh and one of those old Bond villains. Glad you liked it too. Excellent review man, I will let you know what I think of the film once I see it ASAP. I’ll be sure to check out your review!